In 1974, Egypt’s president, Anwar El Sadat, embarked on a series of economic reforms, pursuing an open-door, or ‘Infitah‘, economic policy. Wishing to encourage foreign and domestic investment in the private sector, Sadat sought to reverse the policies of his predecessor, Gamal Abdel Nasser, under whom Egypt had seen massive nationalisations and the emergence of a planned economy with little private investment. These reforms also had a political factor; Sadat was seeking to move closer to the United States and the West and to distance himself from the policy of ‘positive neutralism’ employed by Nasser in regard to his attitude towards the Soviet Union and the West. Nasser’s policies had alienated opinion in Britain and the United States, and led to the withdrawal of investment offers to Egypt, and eventually to the nationalisation and crisis of the Suez Canal. By moving closer to the West, Sadat hoped to attract investors back to Egypt. Sadat’s government began by privatising large state-run firms, and returning land that had been nationalised under Nasser to its former owners. This policy had the desired effect; foreign investment returned, land speculation was rife, the construction and tourism industries enjoyed a boom and consumer imports increased. Egypt still had a large debt burden, and in late 1976 Sadat took a series of loans from the World Bank with the condition that state subsidies on foodstuffs and other essential commodities would be severely limited. On January 17, 1977, the government announced plans to cancel around LE277 million (around £30 million) worth of subsidies, especially on food, as well as the cancellation of bonuses and pay rises for state employees. This immediately led to rapid price increases. Reaction to the announcement was immediate. On the morning of the 18th workers in factories around Cairo walked out. At Helwan, an industrial city just south of the capital, workers rushed out of the factories and on to the streets in spontaneous demonstration against the government. Workers in Shoubra el Kheima, to the north of Cairo, did much the same, in many cases occupying their workplaces. Students of engineering at Ain Shams University held mass meetings and organised a march on parliament, which was joined by civil servants and students from Cairo University. A delegation of students entered parliament to present a set of demands to MP’s, and when they did not return for some time clashes broke out between demonstrators and police, leading to the rally being broken up by force. Opposition to the state’s new economic plans were not confined to Cairo. Factory workers in Alexandria led demonstrations and strikes with support from students of Alexandria University, and in a few days unrest had spread to Mansoura, Quena, Suez, Aswan and many other urban areas around the country. Incidents of violence between protesters and the police increased, as did acts of sabotage. Railway lines were cut and tracks blocked, railway stations were set on fire and police stations attacked. 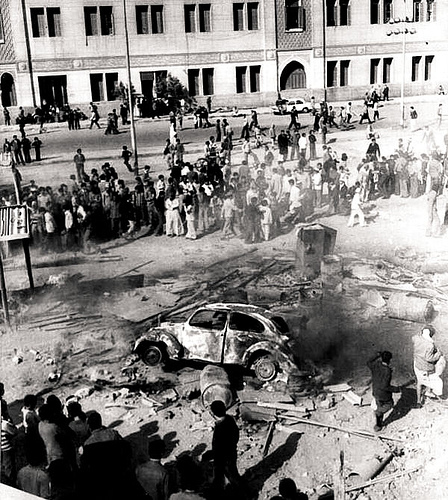 Hotels, shops, casinos and upper-class districts became targets of popular anger, as did the headquarters of the ruling Egypt Arab Socialist Party in Cairo, which was attacked and set on fire. Crowds attempting to reach the Ministry of the Interior were violently dispersed and fired upon by troops. In some areas, arms and ammunition were seized from police stations by demonstrators. Strikes and demonstrations in industrial districts grew in intensity, with workers in a single factory often walking out and touring other plants in the area to convince others to join them. An example of this was in Giza, where striking workers from the textile factories were joined by thousands from print shops, wool factories, silk factories and military plants. In Helwan large-scale rioting broke out, with the railway lines between the city and Cairo being cut. Attacks on shops, banks, and government buildings were met with brutal force from the police, fearful of demonstrators seizing control of arms from sieged police stations. Government buildings in Cairo were ransacked, and another attempted march on the parliament building in Cairo was met with violence, as was a march on the presidential palace, and demonstrators were again fired upon, leaving many people dead. Within just two days rioting and strikes had occurred in most major cities and industrial towns of Egypt. Shocked by the intensity and rapid spread of the protests, the government cancelled its economic decrees on the night of the 19th after only forty-eight hours. In an attempt to contain unrest, it ordered a military crackdown and deployed army units in to the streets who responded to unrest ferociously. Fighting continued until the next morning, with rioting taking place throughout the night leading to the deaths of many demonstrators and arrest of many more. Owing to the savagery of the state response to the insurrection, it is estimated that around 800 people were killed during the uprising with hundreds more injured. Within just two days rioting and strikes had occurred in most major cities and industrial towns of Egypt. Shocked by the intensity and rapid spread of the protests, the government cancelled its economic decrees after only forty-eight hours. Steven, if you want to read about food riots in general, I recommend "Free Markets and Food Riots" by David Seddon and J. Walton. Covers food riots all over the world. Hossam el-Hamalawy's wrote his MA thesis on the riots. Thanks for the article Alex! Highly inspiring. Khawaga, do you know if there is any online access to the thesis you mention? I can ask Hossam for it. But, if you're lucky, you might be able to find it on the website of the American University in Cairo. Thanks! That would be fantastic! i tried the site but no results. It would be good to translate something on the issue in greek; its vital to have a better view on issues across the water. Taxikipali, I sent you a PM regarding the thesis. I need your e-mail to send it to you. Send me a PM Erica and I can e-mail it to you. Edit: And please check Free Markets and Food Riots if you haven't yet. It's an excellent book. Do you think it would be okay for us to host those in the library Khawaga? Not sure, I would have to ask Hossam. I'll get back to you.